This will not be a blog about cooking machboos. I’ve already written about machboos, and I did not much change the recipe from when I made it for Qatar last August. 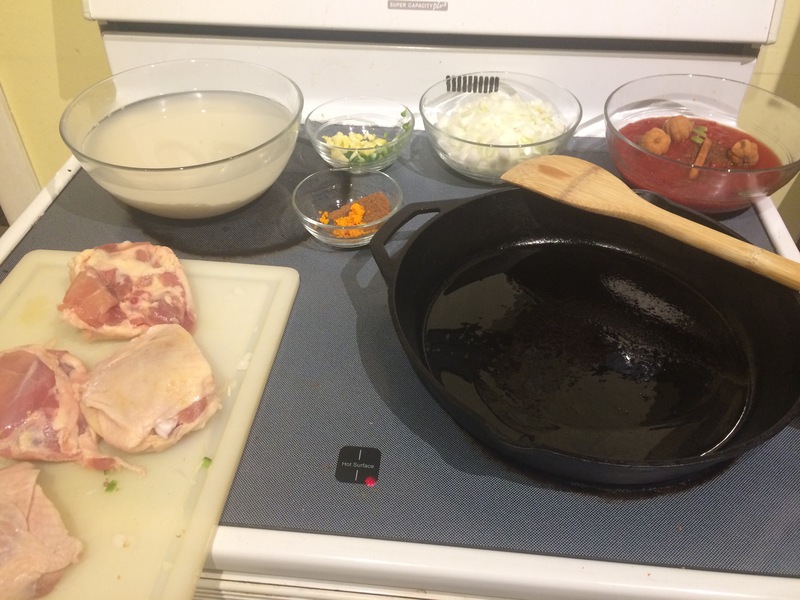 The only real change I made was to use chicken thighs, which somehow made an excellent dish even better. Every ingredient for machboos, ready to go in one at a time. This will, instead, be a blog about how easy and great machboos is as a meal – perhaps the best example of what I hoped to get out of this project. As I’ve said before, I am not out to discover world cultures by preparing perfect, multi-plate dishes representative of a country. If I want to discover a culture, I’m going to save my money, get on a plane and spend some time in a place. Sure, I’ll stumble upon bits and drabs through this project. But I’m doing this mostly so I can expand my recipe collection. Plus, I don’t think you can capture a culture based on one dish, or even a series of dishes. Case in point: France. I was fortunate to spend a week in France last summer, traveling around southwestern France for a few days before heading up to Paris. But while I was there, I stumbled upon a Buzzfeed list of 44 classic French meals you need to try before you die. And at the top of the list, for me, was cassoulet. That was in July. It took until January to find the time, energy and money to put together a cassoulet dinner. Time? I needed a three-day weekend to make it. Energy? I spent at least 8 hours in the kitchen on Saturday and Sunday, and swore at a pace of every 12 minutes. Money? Winning a bowl game prediction pool gave me the spare cash I needed to buy the pounds upon pounds of meat for the cassoulet. We will get back to machboos, even though this is not a blog about it. So on Wednesday, after work, I went to my favorite Portland pig butcher, Tails & Trotters, to pick up the meat bill for the cassoulet. The order included: 2 ham hocks, a pound of sausage, a pound of coppa, a half pound each of pancetta and prociutto, plus some skin and salt pork to boot. As the helpful butcher prepped my meat, he asked me if I was making a cassoulet. “Good luck!” he said. A few days later, I still needed to get my duck confit. I went to CityMarket NW and got 3 duck legs, plus some fat. The meat monger asked me if I was making a cassoulet. “Good luck!” he said. I started to panic. What was I getting into? Was this even possible? I didn’t want to blow $50+ on meat only to get over my head. Crap. I always undercook my beans. 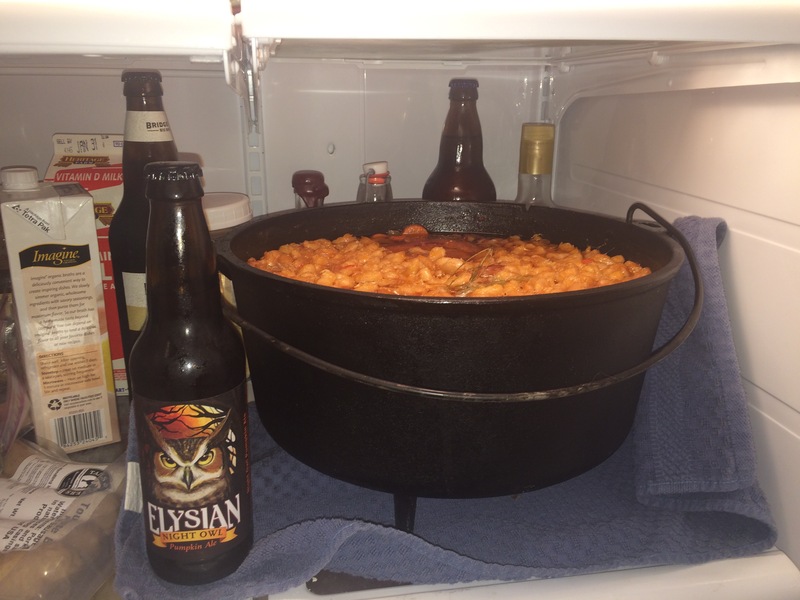 I spent a good six hours plus on Saturday doing the first phase of the cassoulet cooking. I browned meats, boiled beans, stewed stews, used my oven as a stove because my only cast iron pot big enough for the cassoulet had legs. So after this long batch of pork-filled kitchen extravagance, I still had to make dinner for Saturday night. And that’s where machboos came in. 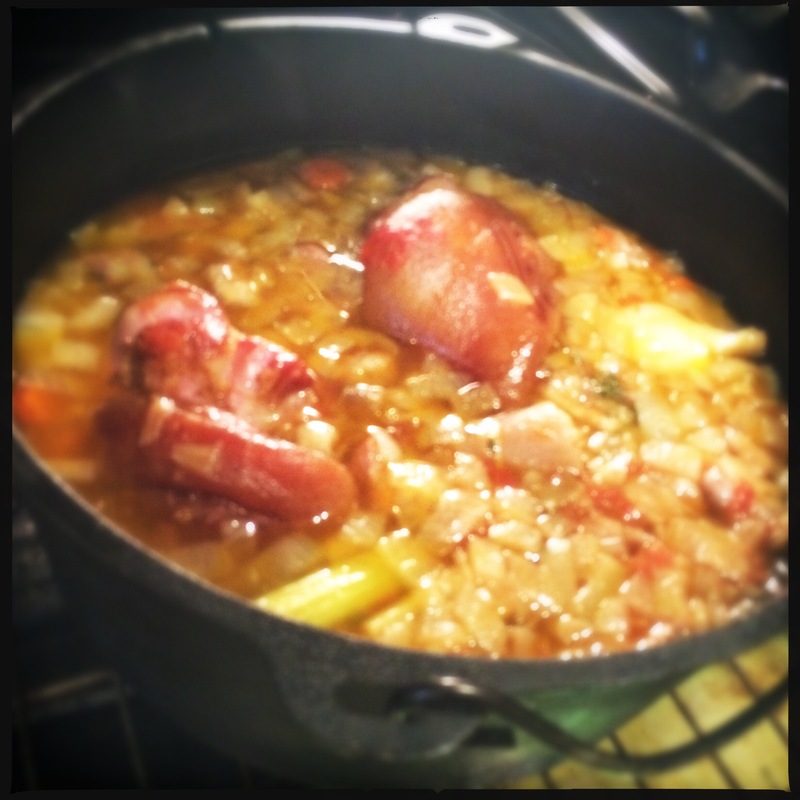 This easy, one-pot, relatively light dish was the exact opposite of cassoulet. Where cassoulet was laden with beans and broth, macbhoos was airy. Where cassoulet had rich flavors of ham and garlic, machboos is dominated by the baharat and loomi. I even made machboos into breakfast the next morning by frying it with an egg. And so, Nation Plates mission accomplished: A meal I never would have known about if not for this blog saved the day. Hooray, Bahrain, hooray, machboos! As for the cassoulet, it turned out great. I have no need to ever make it again – Emily described it as the “meat lover’s pizza of French food” – but it was enjoyable to make once, and something I think any home cook should give a shot at. We had enough to share with at least six other people. And while I regret that this is not a blog about cooking machboos, I’m happy it’s about something more: About the adventure of cooking, and learning something new, and knowing your limits. You can’t see the world from your kitchen. Why try? Let’s just make tasty food instead.